Japan’s strategic choice in Northeast Asia is at the crossroad in the context of the rejuvenation of China since the 2000s. 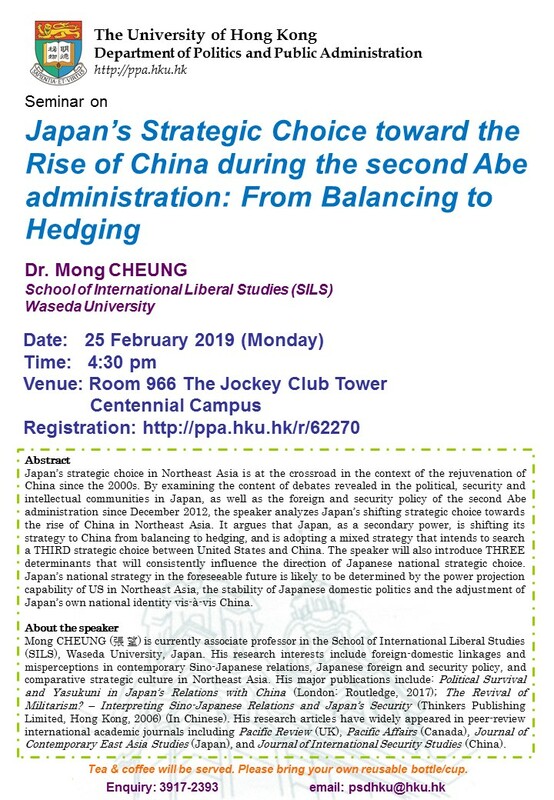 By examining the content of debates revealed in the political, security and intellectual communities in Japan, as well as the foreign and security policy of the second Abe administration since December 2012, the speaker analyzes Japan’s shifting strategic choice towards the rise of China in Northeast Asia. It argues that Japan, as a secondary power, is shifting its strategy to China from balancing to hedging, and is adopting a mixed strategy that intends to search a THIRD strategic choice between United States and China. The speaker will also introduce THREE determinants that will consistently influence the direction of Japanese national strategic choice. Japan’s national strategy in the foreseeable future is likely to be determined by the power projection capability of US in Northeast Asia, the stability of Japanese domestic politics and the adjustment of Japan’s own national identity vis-à-vis China. Mong CHEUNG (張 望) is currently associate professor in the School of International Liberal Studies (SILS), Waseda University, Japan. His research interests include foreign-domestic linkages and misperceptions in contemporary Sino-Japanese relations, Japanese foreign and security policy, and comparative strategic culture in Northeast Asia. His major publications include: Political Survival and Yasukuni in Japan’s Relations with China (London: Routledge, 2017); The Revival of Militarism? – Interpreting Sino-Japanese Relations and Japan’s Security (Thinkers Publishing Limited, Hong Kong, 2006) (In Chinese). His research articles have widely appeared in peer-review international academic journals including Pacific Review (UK), Pacific Affairs (Canada), Journal of Contemporary East Asia Studies (Japan), and Journal of International Security Studies (China).